Gżira United president Sharlon Pace said that he is planning to hold talks with officials from the University of Malta over his plans of turning the current stadium at Tal-Qroqq into state-of-the-art sport facilities. Pace on Thursday addressed club fans during an Extraordinary General Meeting during which he explained the club plans of building a 5,000 capacity football stadium which will also include a tennis court, a multi-purpose pitch and parking facilities. The venue will also include a hostel and offices which will be used by both Gżira United and the University of Malta. 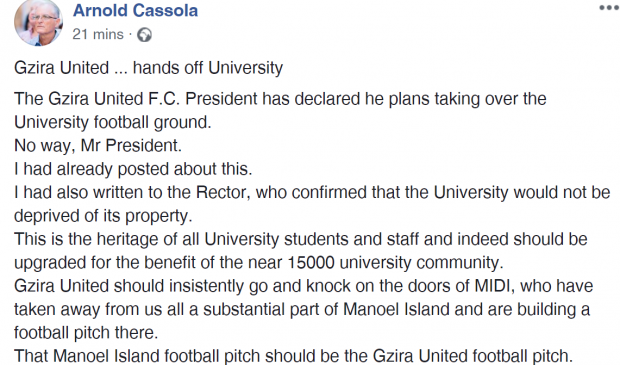 "At present, we do not have an agreement with the University of Malta," Pace said at the end of the EGM where club fans gave an overwhelming approval to the club's plans. "In the coming weeks we are planning to hold talks with them and hopefully we can reach an agreement. 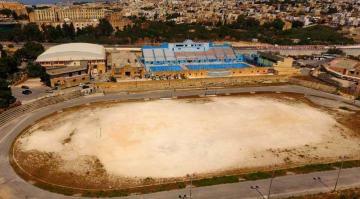 Gżira United are looking to renovate the football ground at the University of Malta. "We have already spoke with the Ministry of Education and the Parliamentary Secretary for Sport who both backed our proposal. "It's my dream that our club will have the stadium in Gżira and I'm optimistic to convince the UOM to change their stance. "But if they keep their position then I will have no problem in finding a new site and build a club stadium outside Gżira." Earlier on Thursday the University of Malta said that there is no agreement in place for the use of its football stadium with any sporting body, including Gżira United. “The University of Malta would like to make it clear that there is no agreement for the use of its stadium,” the University said in a statement. The UOM said that in the current circumstances its positive remained unchanged. “It’s not possible, at the moment, that Gżira United FC makes use of this facility and even more carry out infrastructural work on the university property,” the UOM said. The university said it hoped that another solution will be found so that Gżira United FC could carry out their plan.